King Sunny Ad? (Sunday Adeniyi, born 1946) is by far the most popular performer of Nigerian J?j? music. 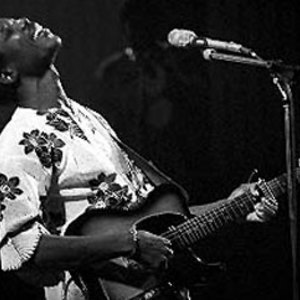 With his band, King Sunny Ade and His African Beats, King Sunny Ade became an international star across Africa during the mid-1980s, touring and gaining a significant audience in the United States and Europe as well. He is known as the Minister of Enjoyment. Born to a Nigerian royal family in Ondo, Ade left grammar school to pursue his career, which began with Moses Olaiya's Federal Rhythm Dandies, a highlife band. Born to a Nigerian royal family in Ondo, Ade left grammar school to pursue his career, which began with Moses Olaiya's Federal Rhythm Dandies, a highlife band. He left to form The Green Spots in 1967. He formed a record label in 1974, fed up with being exploited by a major label. Beginning with Juju Music, Ade began gaining a wide following as Mango Records, a subsidiary of Island Records, released his albums. He was soon billed as the African Bob Marley, and headlined concerts in the US. Soon after, Nigerian imports (mostly pirated copies) of his massive back catalog began flooding the Western market. Island, concerned about sales and Ad? 's refusal to include more English in his repertoire, cut him loose after his third LP, 1984's Aura. By the end of the 1980s, Ade's star began to dim, and his albums sold less, though he continued to garner critical acclaim and widespread popularity in Africa. 1998's Odu, a collection of traditional Yoruba songs, was nominated for a Grammy Award. He has also become one of the most powerful people in Nigeria, running multiple companies in several industries.